DDOS (Distributed Denial of Service) attacks can ruin anybody's day and can cost your business thousands of dollars in lost revenue, loss of page rank and a hurt reputation. AYKsolutions has partnered with some of the best in the industry to bring you cost effective yet powerful DDOS prevention solutions. We offer ddos protected servers and remote DDOS protection. Our technology is able to protect both domains and IPs. Choose a tab below to learn more about our ddos protection services. We can deploy DDOS protected servers out the locations listed below. Each facility has it's strengths, from the amount of bandwidth that comes with every server to the level of protection we offer. To get more details, please contact us using the links below. The servers located in Bucharest are protected by our proprietary anti-DDOS technology that can mitigate attacks up to 10Gbps in size. This solution is ideal for clientele who run applications such as video streaming and CamFrog. To get a custom quote or learn more about our Bucharest facility and servers, please Contact us. We have two levels of protection out of Los Angeles: Basic and Advanced. 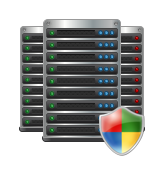 The server hardware can be identical for both levels of protection. This facility is a favorite of enterprise level websites and gaming providers (Minecraft, Call of Duty) who need to be up 24/7 with reliable DDOS protection that delivers guaranteed results. Basic protection protects against known UDP and ICMP attack signatures, can quickly null route a single IP, and provides attack reports that include both attack size and duration. Basic protection does not offer any guaranteed performance. For more advanced attacks or for clientele who need coverage for attacks that are gigabit in size with millions of packets per second, our Advanced DDOS package is ideal. It is guaranteed to protect all attacks with up to 95% to 99.9% efficiency. We are able to put in custom rules to quickly mitigate complex incoming floods. The platform is clever enough to learn your regular traffic patterns to ensure that all malicious packets are blocked at the network level, before they ever reach your server. Should you go over your clean traffic allocation, we will work closely with you to find a more suitable bandwidth plan. We will not hit you with large 'extra' hidden fees. We are also able to deploy new infrastructure quickly to meet your growing needs. Basic protection packages start at around $150/mo and go up based on your hardware and bandwidth needs. Due to the custom nature of our Advanced platform, we cannot give a set price until we know your needs. To get a custom quote or learn more about our Los Angeles facility and servers, please Contact us. The servers located in Washington DC are protected by our proprietary anti-DDOS technology that can mitigate attacks up to 10Gbps in size. This solution is ideal for clientele who run applications such as video streaming and CamFrog. To get a custom quote or learn more about our Washington DC facility and servers, please Contact us. We have two levels of protection out of New York: Basic and Advanced. The server hardware can be identical for both levels of protection. This facility is a favorite of enterprise level websites and gaming providers (Minecraft, Call of Duty) who need to be up 24/7 with reliable DDOS protection that delivers guaranteed results. To get a custom quote or learn more about our New York facility and servers, please Contact us. The servers located in Milan are protected by our proprietary anti-DDOS technology that can mitigate attacks up to 10Gbps in size. This solution is ideal for clientele who run applications such as video streaming and CamFrog. To get a custom quote or learn more about our Milan facility and servers, please Contact us.